Joana Amaral Paulo, researcher at the Forest Research Centre of the School of Agriculture in Lisbon offered an oral presentation entitled "Research and knowledge transfer for the promotion of sustainable agroforestry management models" at Agroglobal, the largest Portuguese conference related to the Agricultural sector. The presentation included results of Josep Crous-Duran's PhD thesis showing evidences that in agroforestry systems (where forest species and agricultural crops and/or livestock are combined) have a better economic and environmental performance when compared to forest or agricultural mono-cultures systems. "A suitable combination of trees and crops and/or animals in 1 hectare of agroforestry system can obtain yields comparable to 1.12 hectares in monoculture systems. This result can be explained due to the increase in the efficiency in the use of natural resources (soil, light, water and nutrients) when the elements are combined. In addition, the agroforestry systems can also contribute to the reduction of soil erosion rates, nitrate leaching and increase carbon sequestration” stated the speaker during the presentation. The public present at the conference included mostly representatives of the agriculture and forestry sector. The Portuguese Secretary of State for Forestry and Rural Development, Miguel João de Freitas, closed the session. 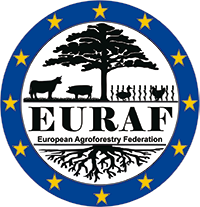 Joana Amaral Paulo and Josep Crous-Duran are delegate and sub-delegate for Portugal of the European Agroforestry Federation, which promotes the knowledge around the potential of new agroforestry systems in a sustainable rural development context.